I mentioned last night that I had an intention of producing a second version of my paper collage print from the 90's as a demonstration during my woodcut class, but I ran short of time. Here's an update on the project, actions before, during, and since the class. Having done the rubbing of the block last week, the next step was to use that image to create a second one that I could color, cut up, etc. When you don't have a light table, a window on a sunny day is the easiest alternative. 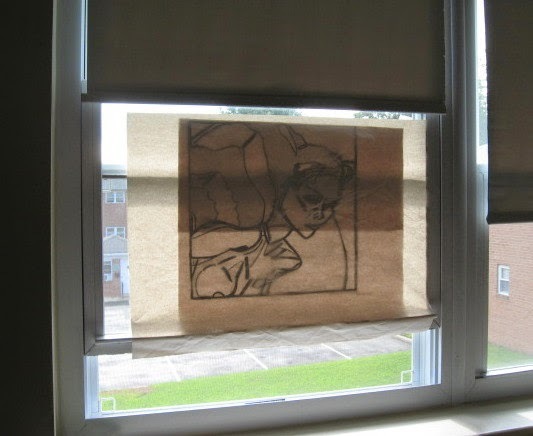 On Monday, I taped the rubbing (traced with a marker) to my kitchen window, taped another piece of newsprint over the top, and used a pencil to trace the shapes. On Tuesday afternoon, I used colored pencils to draw the color shapes, based on the original paper collage from Carbondale. The shades and hues didn't have to match exactly, as it was just a guide for using the various colored papers I had in stock. 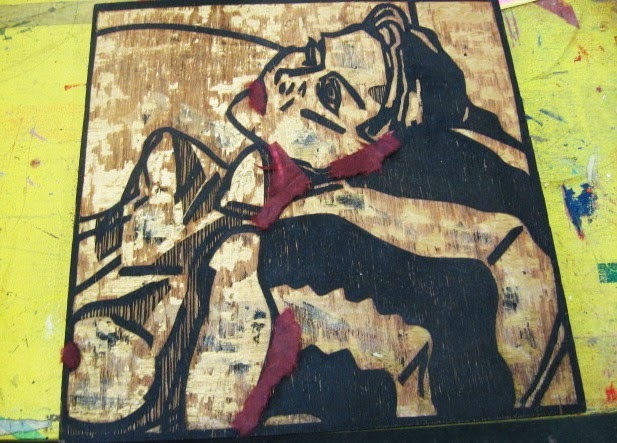 I brought this and my paper to last night's class, and started cutting the colored piece apart during the last hour of class (didn't have an opportunity to get a photo of the whole piece, but above is shown the skin areas), then used those pieces to start cutting and tearing pieces of the colored paper. This ended up taking far longer than I had anticipated, so after verifying the date deadlines, I decided to postpone the demonstration for a week, and use the last half hour of class to work with the students on other issues. Had time today, so while I was out I stopped by the Studio to finish making color shapes from papers. I had done the blue background, orange/gold basic skin, and brown marbled hair pieces last night. So today I tore pieces of red/gold Thai Unryu for the drapery (above), a red-violet paper to represent deeper shadows (decided to tear rather than cut to emphasize the embedded fibers in the paper). and cut up some nutmeg Lama Li paper that will represent medium shadows. I photographed these pieces on top of where they will be printed on the block to make it easier for me to figure it out next week. I carefully packed up all the pieces of color to take home. There's nothing more I can do until it's time to print it next Tuesday. The main piece of white backing paper that will hold this whole piece together will come from one of my oversize rolls of Japanese paper. 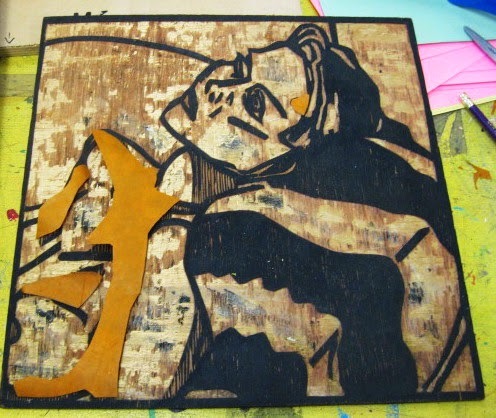 The latest round of woodcut classes in Belmar started tonight. I had five students total. One who actually started during week 4 of the previous session, my two new students from last time are continuing where they left off, one who was in my class two years ago and decided to return, and one truly new person. Having been granted some storage space for the duration of the class, I went over in the afternoon with a first load of class supplies, and took advantage of the space to reorganize my tote bags of ink, brayers, etc. Then in time for class I brought over everything else. With a very mixed group of experience and goals, I was busy running from person to person most of the night, making sure everyone had what they needed. Wood for those who needed it, a quick tool demonstration here, a printing evaluation there. Showed print group folios to the new people to expose them to ideas. This last thing was leading up to a demonstration of chin colle, creating a piece I intend to submit to an upcoming fiber themed show, but in keeping everyone going, I ran short of time to finish preparing the paper to be attached. I can wait another week to complete that piece and still make the deadline, so I decided to do just that, and use the remaining class time to help the students with their various ongoing pieces. Thanks to my new storage area, loading the car to go home took only a few minutes, but that came after about a half hour of organizing the class supplies and room cleaning. Still, that's faster than some nights when I do this. Meanwhile, we're off and running, and everyone seems excited to make woodcuts. And as usual, too hectic to take photos tonight, but I should have an update on my progress on the fiber piece in a day or two. I had assumed that my next piece would be the Asbury boardwalk print, but I've decided to finish something else to meet a quick deadline. It seems hard to believe, here in July, but there will only be two more shows in Belmar that I would likely be a part of, both new ideas for this year's schedule. One is a show devoted to the classes begin offered, open to any student from 2014. 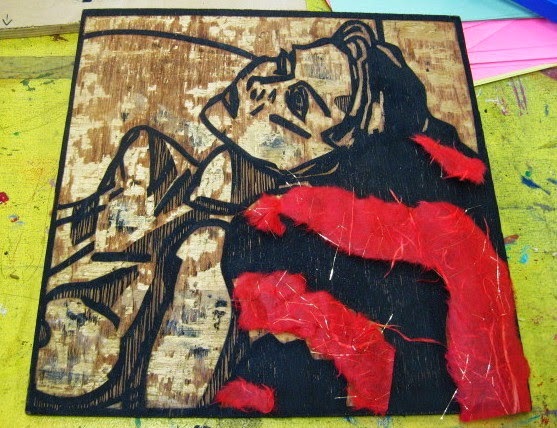 ( I am not, but I've been told that they might want me to put in a piece as the instructor to show what woodcut is like) The other one is one devoted to fiber arts, which includes fabric and paper. Not my usual way of working, but I remembered that I have this above piece, a mixed media collage. It's fairly old, dating back to Carbondale, so around 20 years old. I have no memory of why I did it, other than perhaps curiosity about trying a process. I would have acquired the various decorative papers at the Pearl in Paramus, but I don't remember if I got them just to do this, or had them in stock. The design is based on a charcoal figure drawing from the class I used to sit in on from time to time. My memory is that I drew and cut the image first. I proofed it on a piece of Japanese unryu paper using a very lightly colored water based ink, barely visible. 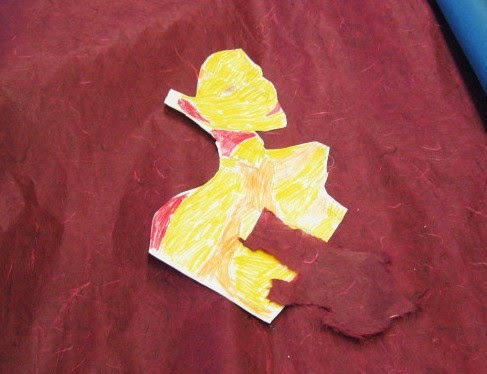 Then I cut/tore pieces of colored paper into shapes that roughly corresponded to the composition of the print. These pieces were glued down to the surface of the proof, like a jigsaw puzzle. When it was dry, I inked the block with relief ink, carefully placed my assembled collage on top, and ran it through a press. Luckily it worked on the first try. Having shown that I could do it, I never did repeat the process, and the piece was never framed or mounted for display purposes. 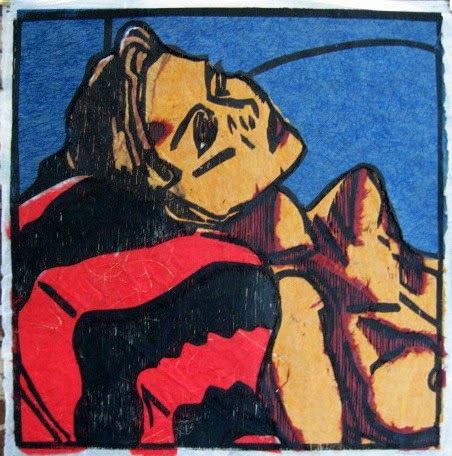 In recent years I have shown it to my local print classes, as an example of a possibility of relief printing. 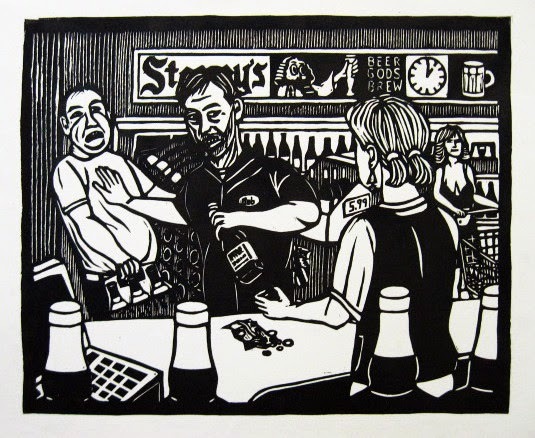 A few years ago I taught a one day class in linocut in my Studio, as part of a special Ocean Grove art weekend. The limited time for the workshop meant we had to keep things simple, but I picked up a few more types of colored paper locally to have available for that class, and some used it. 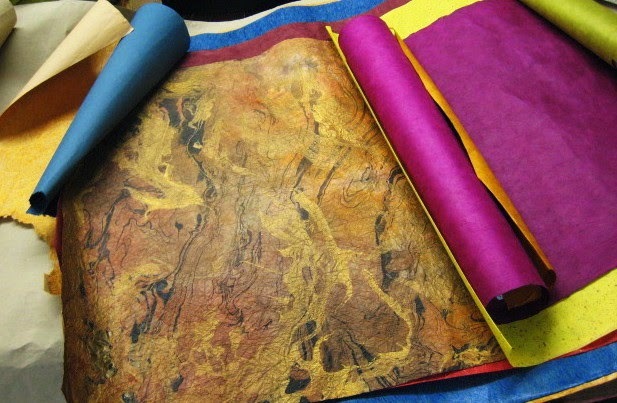 I have also brought my rolls of colored exotic papers to the woodcut class at times, and some of my students will try a piece to see how color and texture can affect the design of their woodcut. As I said, I hadn't been thinking about being in this fiber show, but then I remembered this piece. It's bold, likely different from anything else they'll see, and it meets the rules of the show. My biggest concern is that it's a unique piece, and one that I use to show in class. Not that it's likely to happen, but if it sold, I wouldn't have one any more. So I made sure that I still had the block post-Sandy (and I do), and since I have lots of colored paper, I decided I'd quickly make another one specifically to put in the show. And since I have a new round of woodcut classes beginning next week, the piece can also be used to teach a specific lesson. I'm going to do this one in a more traditional chine colle process. The thin colored paper pieces will be printed and mounted to the backing paper at the same time. 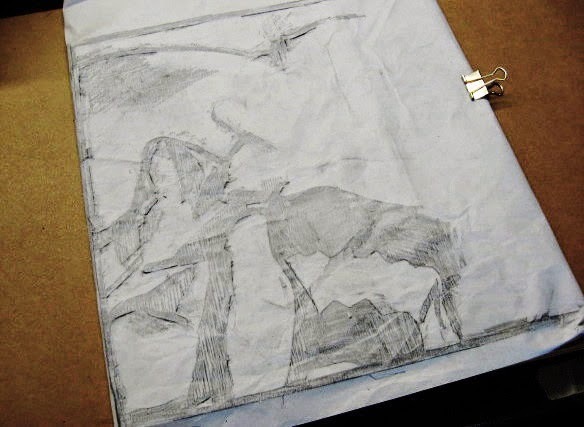 My first step was taking a pencil rubbing of the block on a piece of newsprint, shown above in progress. When that was done, I went over the pencil with a black marker, to firm up where the black and gray shapes are, shown below next to the original wood. The next step will be to choose which colors I will use this time, and then to cut out the pieces to match the spaces where they will be appearing in the print. It all goes together next week. Today I attended a function that had nothing to do with printmaking, but a bit to do with the Studio. 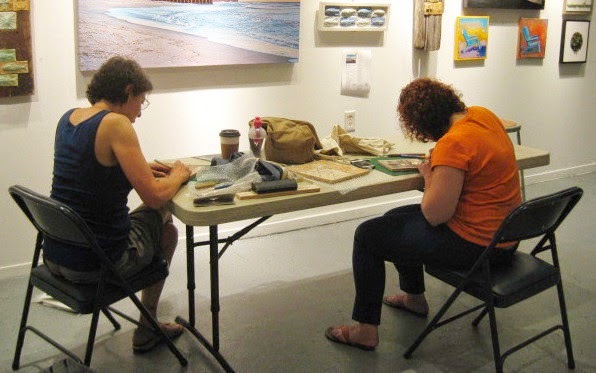 When Molly and I first moved in, the Jersey Shore Arts Center had been open for about 5 years, and that came after about two decades of abandonment. However a group of Ocean Grove residents, who had known the building as Neptune High School (built in the 1890's) acquired the disintegrating structure and set about preserving it while repurposing it as regional arts center. By any standards, they were incredibly successful. Much of the year, the building is hosting classes, events, and working artists 7 days per week, A lot of work had been done before we set up our print shop, but construction has continued all along, including a lot of physical labor from senior citizens. The basement (our floor) was brought to a functional level, but the 1st and 2nd floors had been completely restored, including the spectacular 600 seat theater and the classrooms, with chalkboards and built in cabinets. The 3rd floor, on the other hand, was very much a wreck, still looking like the abandoned derelict it had been. The front stairway was closed, so the only access was by the elevator, and once in a while I made the trip, usually if I needed to find Herb. The surviving architecture showed an incredible potential, if you could ignore the state of the ceiling, walls, and floor, and the piles of junk, But they had plans. Eventually I learned that the plan was an educational program to teach cooking skills to people with visual impairment. Gradually the rooms were cleaned out, repairs were made. Several dormers were installed in that roof, with windows that would bring in much natural light. Acquired commercial kitchen equipment was stored for lengthy periods of time in the hallway outside the Studio, waiting to be moved upstairs. Last year they started building a central staircase similar to the one that joined the 1st and 2nd floor, this one connecting the 2nd and 3rd. When I was in the building on other business last week I was told that the new staircase was now open. 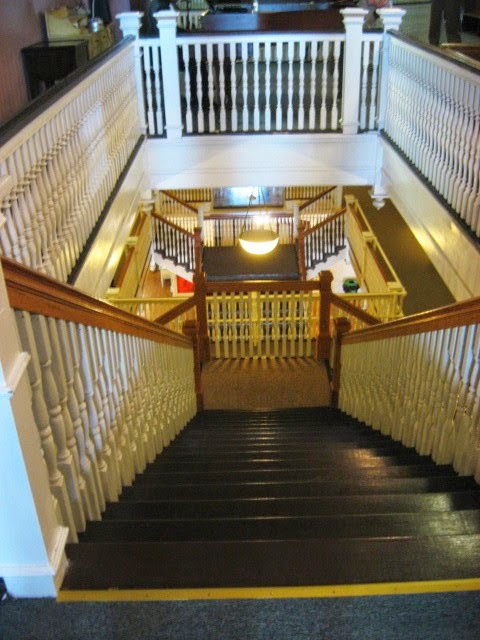 The above photo is a view looking down it toward the earlier central grand staircase. And I was reminded again about today's big event. This morning they held the grand opening and dedication of the 3rd floor. 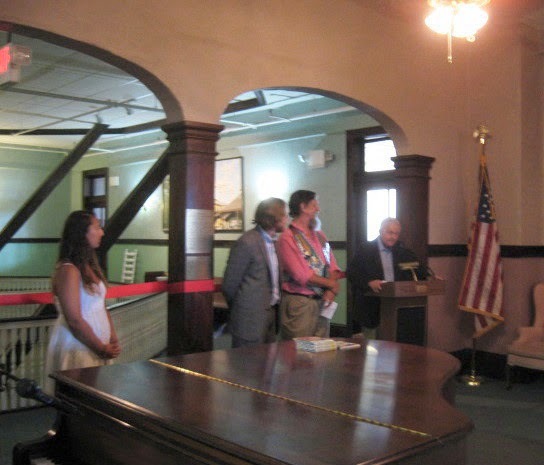 Herb (at the podium above) presided over a program that included people involved in the reconstruction, and local political types, before cutting that red ribbon behind him. 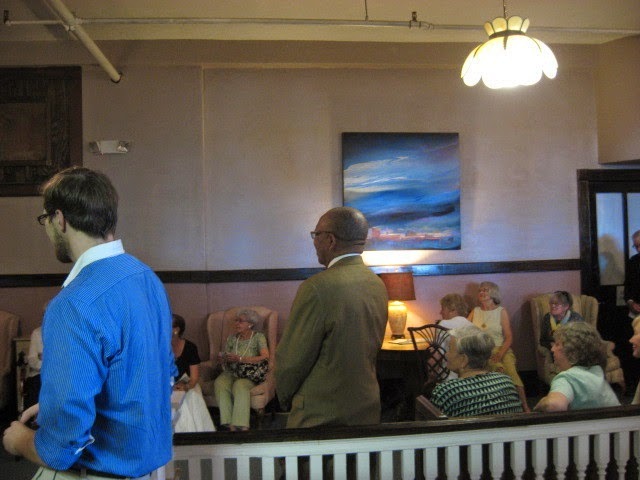 There was a good crowd, at least forty or fifty, with an average age that was probably twice mine. The new third floor also includes a "black box" type theater, which will hold up to 80 people, using vintage wooden pews from a church on the edge of the Adirondacks. And some of the classroom spaces up there will be used for education, or possibly more artist studios. But the focus today was on the cooking mission. A large section of the floor has been set aside as dining room. In the above photo, you can see a piece of the kitchen, and to the right, the wood framed windows that had once looked from this classroom into the hallway. The white tables would eventually hold a breakfast (or perhaps brunch, when it was served) provided to us by the JSAC. There were coffee, tea, and juice, fresh fruit, quiches (meat and veggie), and mini bagels with expected things to spread on them. 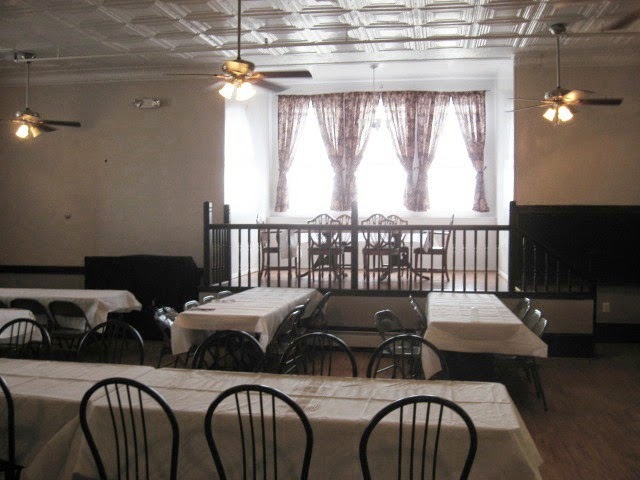 The above photo shows a different view of that dining room, from the hallway, showing about half the tables and chairs. On the right side you can see one of the old chalkboards, and in the center is an elevated platform in front of one of those dormers. The crowd of seniors had filled most of the tables on the main floor, but I was able to join some building people at that elevated table while we enjoyed the special occasion. Due to the red tape involved in setting up both an education program and food service, the culinary school may be a little while in coming. 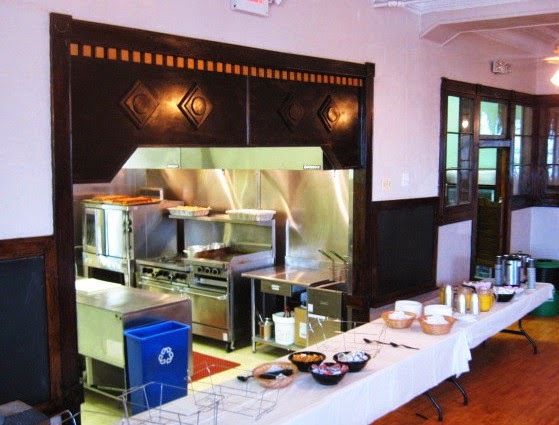 However, the upstairs theater has already hosted some events, and the kitchen has been used for catering, so if you are coming to an event in the building sometime, don't be surprised if it's up on 3. And we'll give Herb a few days to rest before he begins the next major project. About a week or so ago I got a call from Steve McKenzie, who I've known for many years from his involvement at PCNJ. Several years ago he recruited me to be part of a relief print show at what was then called the Rahway Arts Guild, my first show in that building. He stopped by my Studio and ended up choosing 9 pieces. If I remember correctly, he was teaching some woodcut classes at the Newark Museum for a while. 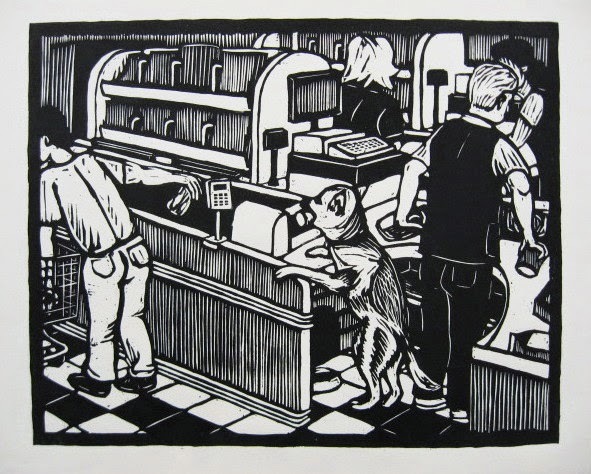 It turns out that in recent years he helped create a publicly accessible print shop there in the city, The Newark Printshop, in the city's college district. The reason for the phone call was that he was curating a print show at a new nearby art center, and he wanted me to be a part of this one, too. A few days later, having checked my calendar and gotten more details, I told him I'd do it. My biggest concern was how to get the work there. The gallery is in a fairly respectable part of Newark, a square mile or so that includes the train station, the Performing Arts Center, the arena, the colleges, the library (I'm in their print collection), the museum, and some big businesses. However, all that popularity means huge amounts of traffic, lack of parking, and the confusion of dealing with unfamiliar streets. Exact mode of transportation could be worked out later, but it was clear I should pick work that would be easy to transport. Decided to go with some supermarket prints. They are bold and popular with crowds, and easy to carry around. Steve had chosen several for the Rahway show, so I knew he liked them. However, I didn't want to repeat those specific prints, or any others that have been in shows he probably saw. So I chose these two, two of the last three completed. We were requested to deliver them between Monday and Friday this week. Weather reports predicted heavy rains for the first few days of the week, but Thursday looked good- sunny and less humid. That gave me a few days to consider my options. Steve gave me little confidence that I'd find reliable parking near the gallery. One possibility was to take the train to Newark Penn Station and just walk from there. Almost all of the trip would be a straight line down Raymond Blvd, a major street through the heart of the business/arts district, and a reasonable distance to cover on foot. The more expensive option, with round trip train tickets up near $35 now, and there are gaps during he day when the train doesn't run. The other possibility was to drive. In the past I have parked at the Newark Museum, just blocks from the highway, and also a straight line walk from the gallery down Washington St. This morning I made the call to go with the train, which I would take from Manasquan, where my parents are a short walk from the train station. Running later than I had wanted, I dropped my car at their house, carried my wrapped pieces up to the station, but realizing I should have more money, I stopped at the bank next door. By the time that was done, the train had come and gone. Checked the posted schedule and the next one was two hours away, a schedule that would put my return into rush hour. So I went with the back up plan. Walked back to my car and drove directly to Newark. I had taken the precaution of writing out both train and car directions for myself last night. And all might have been fine, except that in my head I believed I needed to go to exit 15 off I-280, but it turns out I needed exit 14. And although my notes included all he streets between the gallery and my destination, I had no maps beyond that, leaving me with nothing by my internal sense of direction and my memories of the street names I had studied last night. Not the most efficient way of navigating. Mostly it was running across a street name I knew, following it for a while until it lead me to another one (or I realized I was heading in a wrong direction), gradually working my way back to the neighborhood between the gallery and the museum. Signs were small and sometimes misleading- I drove past the driveway for the museum parking lot twice without seeing it. In the end, I pulled into a commercial lot that turned out to be right around the corner from the one I had been seeking. I grabbed my stuff and headed down the street. Tried calling the gallery director as I left the lot (as had been suggested), but I couldn't get a signal around there. So I just called when I got to the door and someone came down to let me in. The gallery is in a large loft space (formerly a t-shirt business if I understand the sign on the door) reminding me of a group show I had in Union City back in 1998. I unpacked my pieces, filled out the intake form, and received a short stack of the cards you see below. More than 40 artists are listed, some names I know well, but many I don't. The place is called the Index Art Center, recently relocated to 237 Washington Street in Newark. 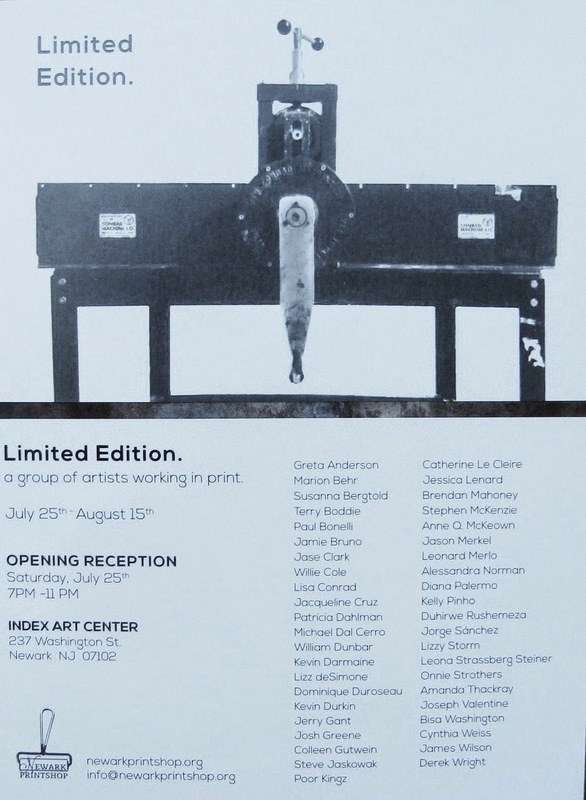 The opening reception is on Saturday, July 25th from 7 to 11 pm. Considering how much trouble I had navigating Newark on a sunny afternoon, I'm pretty sure I don't want to try it at night, and long drives on the Parkway in summer can be a big hassle. The show remains on display through August 15th. Check the gallery website for hours, etc. Getting back to my car was simple, and I asked the parking attendant for the best route back to 280. I followed his recommended path and spotted the elevated road, but only saw a sign for east bound, and I needed to go west. Maybe this was a case where you go one way and eventually come to a u-turn, but I didn't want to explore that yet. Meanwhile, I continued under the overpass, looking for a place to maybe turn around, and I saw a sign for Bloomfield Avenue. Finally a chance to cash in on my decades of residing in Essex County. It would take me in the opposite direction of where I wanted to end up, but it's wide and straight (unlike so many of the Newark roads I had wandered), has its own ramp to the Parkway, and I know exactly where that ramp is. Several minutes later I was on the highway heading for home, and a good hour ahead of rush hour. Needless to say, I'm going to think about other options for picking the work up. after the show ends in mid August. 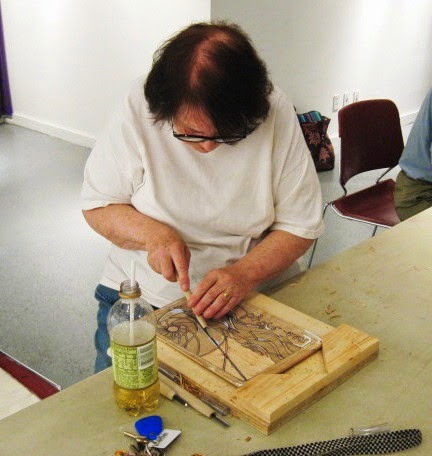 Tonight was the fourth and last night of the current run of woodcut classes in Belmar. One change was expected- an extra student. The extra participant is actually from the next class, but has to miss one of the weeks, so is making it up by attending this time. As always, I started getting ready early in the day, loading most of the car by mid day, except for the wood, which could be damaged by long exposure to the heat inside a car in summer. Unfortunately, for the second consecutive day, major rain was expected for late afternoon and/or early evening. Intermittent showers arrived in late afternoon, so I went to the trouble of packaging my 2'x4' piece of wood in two big contractor garbage bags. At the appropriate time (and in a lull where few drops were falling) I loaded that in my car, then went back to get the last few items- my backpack, food for dinner, etc. Suddenly the real rain arrived. Waited a few minutes to see if it was just a quick passing shower, but without time to waste, I put up my umbrella and started the walk to where my car was parked. Before I made it halfway around the building, the rain had become torrential and the umbrella was doing little good. 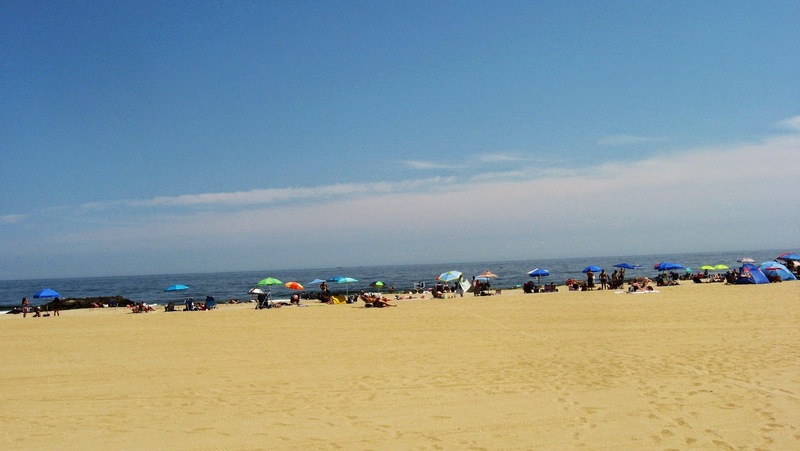 Everything I was carrying and wearing was thoroughly soaked by the time I got in my car, but I was there, with 45 minutes to travel the 3 miles to Belmar. Could have used a little more. Route 35 was quickly being overcome by the rain. Not yet flooded, but I was kicking up a lot of water as I drove, and had to keep my speed to half the limit. Then the road was closed at 16th Avenue, a section along the river that can flood in heavy rains like this one. We were all diverted up 16th, but that wasn't moving much either. Very gradually I crept up to the light at Route 71, where police were now directing traffic, and once across, things got a little better. Still a lot of water, but the rain was lightening a little, and I could steer around the bigger puddles. Main Street was passable with care, and I was in the Boatworks parking lot at exactly the official start time of class, and curious how many would show up. Later the news would tell me we had gotten about 3 inches of rain today, and when you throw in yesterday's storms, two months worth of rain in two days. I got the building open, letting in my newest student, who lives in town. And my two beginners of the past session pulled up shortly after, including the one who comes down from North Jersey, who probably made most of that trip before this weather arrived. I had to wait until the rain eased a little to unload most of the supplies, but I brought in my backpack, which had the cutting tools and some of the print examples I had. We got out the tables so people could continue with last minute cutting, as I looked at progress so far and made suggestions. Eventually the rain eased some more, allowing me to get everything else from the car, and letting my last student arrive, giving me all four. 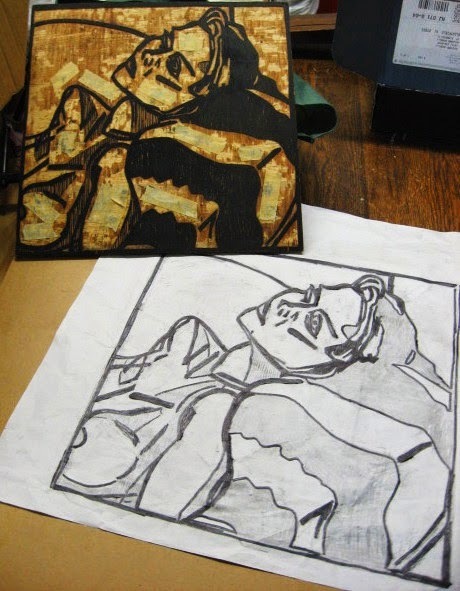 Had a lot going on, alternating between my newest student (reviewing past work, looking at sketches, showing examples from books, and preparing her a wood block) and beginners in their fourth week. Sue, one of that second group, had gotten some pine pieces and started 3 other blocks, and had pulled proofs of one of those and of her birch block. The proofs were rough, but gave her information she used to make adjustments. Toward the end of class she was ready to try again, and between her additional cutting and the better ink, brayers, and paper I was supplying (plus printing lesson), there were improvements. One of the two reprinted blocks can be seen above. And that made it time to clean up and clear out. Rain had come and gone a few times, but was done at this point, making loading easier. My two who started four weeks ago seem very happy with progress on their projects and tell me they learned so much and plan to be back for the next session. My newest student had started her drawing on the wood, which she plans to finish before we start up again, to be ready to start cutting in week one. Whether Mary comes back is mostly dependent on if she has other commitments, but whenever I see her next (class, critique), I'm sure she'll have something new to show me. Thanks to 4th of July weekend, the first Monday of the month came upon us quickly, and Molly and I decided to push the crit back a week or so. But then she decided she couldn't do this Monday either, but she didn't want to switch the day, leaving it up to me. So the word was distributed the usual ways. I planned to go up to the Studio in late afternoon, get some work done, but heard lots of thunder as the time approached. Quickly got my art stuff into the car, and decided to wait for the storm to pass before driving. On the tv the radar showed a compact little storm that would zip across Monmouth County and then be out of the way. Except that instead it kept its west end where it was, stretched across to the coast, and pummeled a narrow band in between (which included where I live and the Studio) with torrential rain, lightning, winds, etc, for a good two hours. After that things calmed down, and news was reporting no road issues, so I took off. Roads were moving a little slower than usual, but no floods or dangers, and I got up there about 30 minutes before the scheduled start. Other tenants were in the building, so I didn't have to worry about opening up. The lull held up as I moved my art stuff inside. As 7:00 approached I was still alone, and wondering how long I'd stay. I finally heard someone coming down the stairs about quarter after- Sheilagh, one of our regulars. Ten minures later, no one else had shown yet, so we decided to just have a very little critique group. The two pieces are above, her painting and my colored version of the Bd James print. And we enjoyed our refreshments we had brought. By 8 pm no one else had shown (we figured the afternoon of thunderstorms had discouraged everyone), so we gathered out stuff, locked up, and left. Got everything home nice and safe. About a half hour later, I could heat the hard rain again hitting the parking lot around my building, and was glad this night was over. There were probably a few factors that led to my decision today to walk up to the Asbury Park boardwalk and sketch and take notes. The area might have been in mind, because last night one of my movie stations was showing "City By The Sea", a movie from about a decade ago that was set in New York, but when they needed a seedy, disintegrating, hellish location to film in, used a much less gentrified version of Asbury than currently exists. Or maybe it's because I read today's Munchmobile (class of '04) review of boardwalk cuisine and he included some interesting places from Asbury's boardwalk. Or maybe it was just because this week I was looking at this block that has been untouched since 2012 that would require a bit more location research and this was the first nice day in weeks. So in the late morning, I drove up to the Studio, stopped in to ask about some unrelated business, and began my walk east and north. 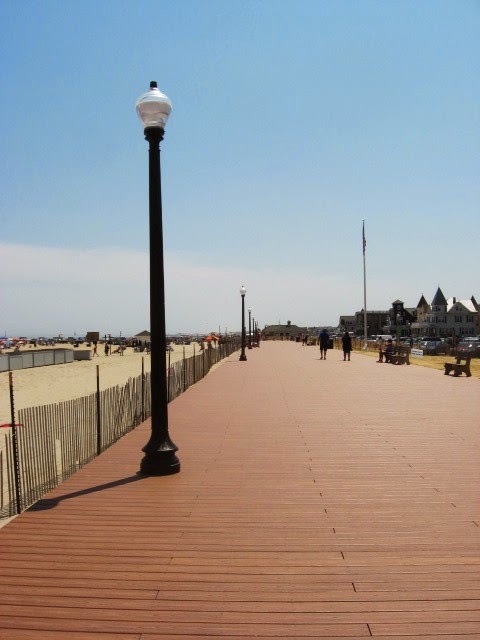 I had been asked recently about how things were looking on Ocean Grove's boardwalk. I was last there early this year, collecting shells from the beach for my class on a rare day above freezing with no snow, and it was functional but not fancy. Since then, they have replaced much of the boardwalk. An example of that can be seen above. 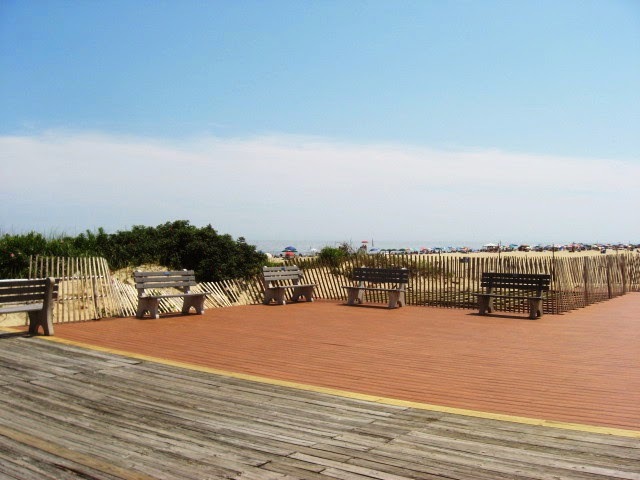 In the center of that photo, you can see where the big dune coming from the left ends, and where there were no dunes, Sandy's waves destroyed the boardwalk. Those new brown boards (plastic coated composite) were used to rebuild those areas. The gray boards (weathered wood) are showing their age, but didn't need replacing right now. Above and below are shots of the length of the boardwalk. Above, shortly after the storm, even the sections that weren't destroyed were shifted, creating a fun house effect, as evidenced by those crazy angles on the light posts. Below, everything is now nice and straight now. In the immediate aftermath of Sandy, it was not possible to walk along the boards into Asbury, as piles of rubble and sand filled that area, so I don't think I had been there in quite a while. I walked through the Casino/Carousel House (both extensively used sets in that movie, great locations for murders and criminals in hiding) and all the way to Convention Hall, the setting for that boardwalk block. I did a few detail sketches in a small sketchbook, and took a few general photos (like the beach scene above), but mostly I was taking notes. On my block, the buildings are done, and what I need is to fill the space with people. I took a lot of notes about what I saw- ages, physiques, clothing, accessories, etc. Plus other details from the area. I can fill in generic figures to start, and then adapt them using the notes from today. Still a few special things/people I'd like to get, but those weren't things I expected to see, so I'll have to work a little harder to figure them out. Meanwhile, I have some stuff to keep me busy next week. 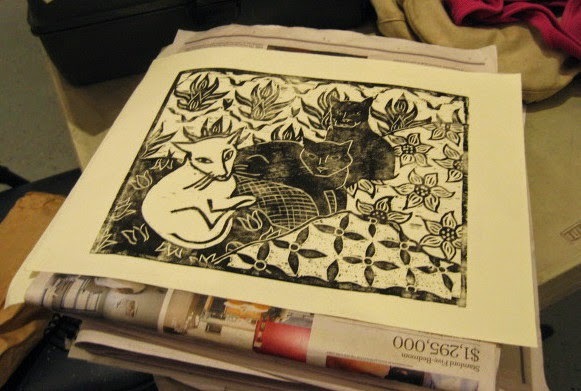 Tonight was week 3 of the current woodcut class in Belmar. My two new students were busy cutting, either using the tools I provide or some of their own. They are making progress and should be ready to print something next week. They asked tonight why it's so difficult to find information about woodcuts out there, or the related tools and materials, and why does the art world give them such low status? All valid questions for which there are no good answers. Meanwhile, Mary pulled proofs of two new blocks, first a piece of multi block image, then a really nice little print of an aardvark. No good answer for why she decided to do that one either, but the results are impressive, so we were all happy to see it. One year ago today I had a similar Sgt. Pepper inspired title on my blog post, noting the anniversary of the start of my notorious Fourth of July woodcut project. Today is the anniversary of the day I finished it. 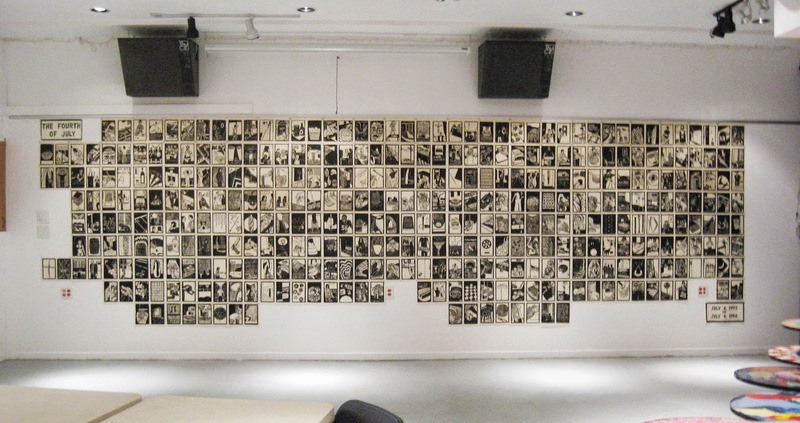 A lot of people thought I was a bit crazy for attempting it (including my print professor at the time), and my students (college and local woodcuts) often react with amazement that I completed the 366 prints in 366 days, as they often struggle to get one block done in 2 weeks. 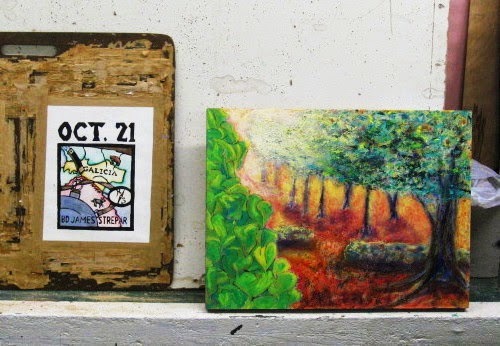 But, as I regularly point out, taking on such a huge task probably advanced me 10 years as a woodcutter, forcing me to find new solutions to that 5" x 8" composition every day, not to mention the challenge of depicting so many different textures and objects. My bound photocopy version is practically a handbook for beginner woodcutters. The above photo shows the most recent display of the whole set, while all the individual images can be seen here. One of my classmates from those days was a painter named John Lustig, who was an influence on the series, in that our whole first year there (the year before I started my series) he worked on a set of four large paintings. From that I got the idea that I didn't have to just work on projects that would be finished when the semester ended. The saints would also span multiple semesters, and it was all good practice for when I was done with school and had to motivate myself to get work done. John had a tradition in those days of working in his studio on New Year's Eve- he liked the idea of starting the new year working on art. Me, if I'm working on anything on New Years's, it's probably trying to get my Christmas cards done and out in the mail, but thanks to my big series, July 4th is kind of an art spiritual holiday for me. We had a lot of rain today, spun off of Hurricane Arthur (which luckily passed well off the Jersey Shore) making a good day to stay indoors. I'd like to get going on something significant soon, and as I was telling Molly the other day, the most logical choice is to get back to the boardwalk series. 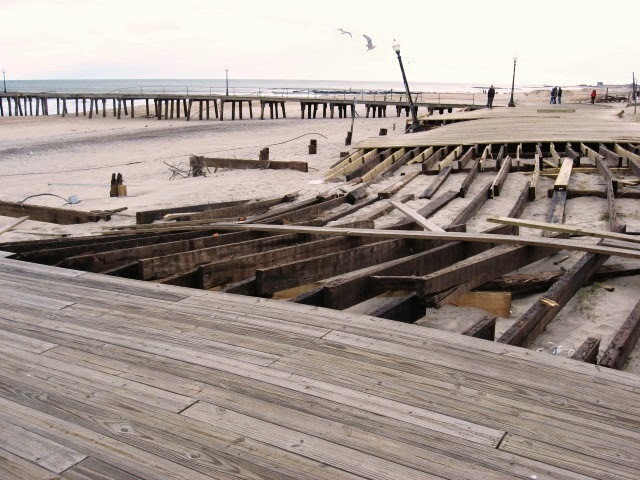 I had a boardwalk block in progress back in the fall of 2012 when Hurricane Sandy showed up, and in some ways we are still all trying to recover from that. 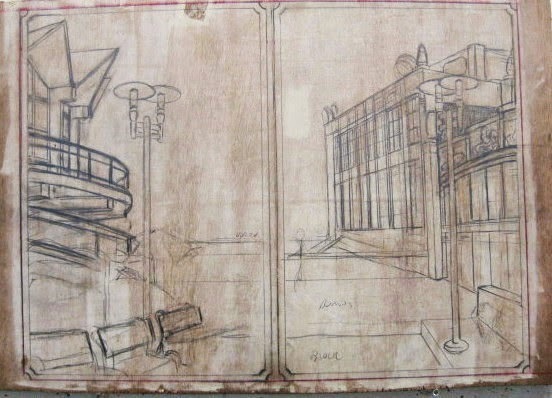 At the time I was working on a general boardwalk daytime scene, to go along with the general night time scene I had done a few years before. This was a little different in that it was set specifically at Asbury Park's boardwalk, although there won't be anything (other than some iconic architecture) that couldn't be found on any other New Jersey boardwalk. I had worked out general composition by that fall, and fixed some details as recently as December 2012, but haven't touched it since. What it needs now is figures. 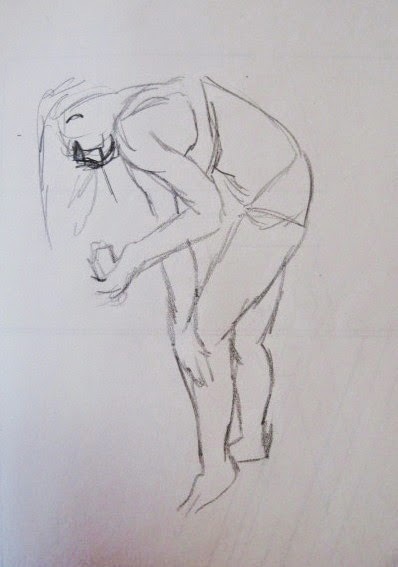 So, stuck indoors for most of the day, I went through some accumulated material I had- photos from publications, written notes, and figure sketches done when I had models in the Studio for other projects, like the rough one below of a girl putting on sun screen. Nothing was decided today, much less drawn, but it was good to get a reminder of what I have to work with, and what kind of references I will need to find. I'm thinking the best time to research and get sketches is probably during the summer, when everyone there is dressed for the experience. Tonight was the second night of early summer woodcutting in Belmar. Had to leave home before the USA Belgium match was finished. Saw the first goal scored (Belgium), on my radio driving to the Boatworks I heard the second (Belgium) and third (United States), at which point I got there and started unloading and setting up. All three students were on time this week, and all had done some work on their blocks since last week. 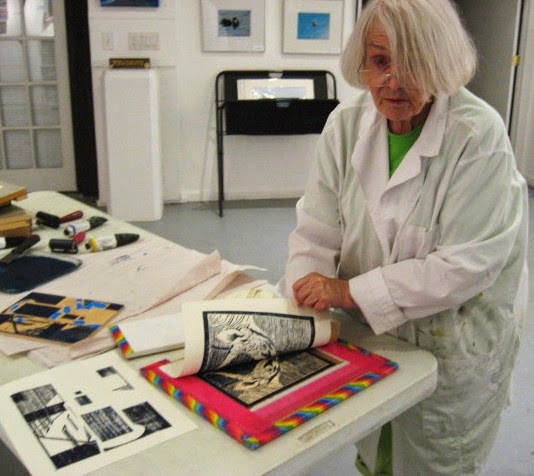 Mary continued on her latest multiblock project, for which I had brought a Diebenkorn book to show her some things relating to abstract color design, which seemed relevant to her project. My two new students had started drawings, so after showing them a few things that had been asked about last week, I did a demonstration of cutting and let everyone get to work. Progress was slow, but everyone had learned to use their tools and no one had gotten hurt, so a successful night. The only real problem was that things were so busy, once again I didn't get around to taking any new photos, to above is an old one of Mary cutting a block, just as she did tonight. Probably more cutting next week, but I'll have printing supplies ready in case anyone gets that far. And in case you hadn't heard, the US team, despite a bunch of late game chance, couldn't get another goal, so we're out now, but I'm sure I'll watch a few more games.